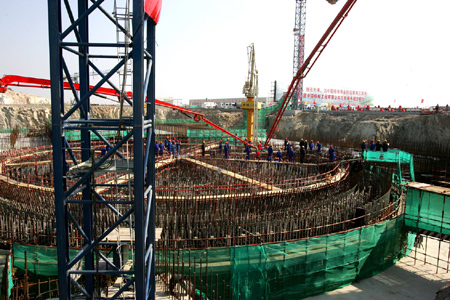 Construction started recently of a 100-billion-yuan nuclear power plant in the coastal city Fuqing, Fujian province, in order to improve the green power supply situation across eastern China. The first two reactors will become operational in 2013 and 2014. Chinese local governments may speed up environmental degradation in the name of maintaining stable economic growth in order to launch investment projects to keep economy humming. A top-notch advisory council has given that warning to the central government, which was urgently asked to prevent the possibility. The expert panel of China Council for International Cooperation on Environment and Development has submitted a suggestion package to Chinese Premier Wen Jiabao and listed the local governments' poor environmental awareness as a "major risk". "The central government should strengthen inspections to prevent the local governments from taking risks of stabilizing economic growth at the cost of environmental protection," the suggestion package, exclusively obtained by China Business Weekly last week, is cited as saying. The panel has contributed its concerns to the situation that local governments in parts of China are still holding the old mindset that higher economic growth is a priority despite the fact that a nationwide campaign to promote sustainable development and harmony has been launched for years. During an interview with China Business Weekly, the panel's member Daniel Dudek says Wen paid great attention to the panel's suggestions when he chaired a recent discussion with the foreign experts of the advisory body. When meeting Dudek, chief economist of the United States-based Environmental Defense Fund and other experts at the panel, Wen says that the threat of a global recession should not shift China's focus from the long-run goals of energy conservation and emissions reduction. Dudek cites Wen as saying: "The current financial crisis represents a "golden opportunity for economic development and environmental protection". Following Wen's assessment, National Development and Reform Commission said recently that China will invest an additional 350 billion yuan in environmental protection by the end of 2010 and ruled out the possibility of investing in energy-crunching and polluting industries. "The increased and speedy investment has offered real stimulus for green industries and green jobs, if the government takes measures to combine near-run remedies and long-run goals together," says Dudek. Dudek says the Chinese government should take more concrete actions to procure "green products" while implementing its 4-trillion-yuan economic stimulus plans. "That will shore up the confidence of green industry and create more jobs," says Dudek. The panel has also warned that many signs have shown that globally, environmental protection is probably becoming prey to rebuilding financial markets and stabilizing economic growth, which are undoubtedly the priorities of the world. "While stabilizing economic growth, China should upgrade its economic structure, develop low-carbon economy and bolster international competitiveness," the panel suggests. The panel asks China to make technological and policy preparations in the endeavor and when it drafts its 12th five-year program (2011-15), the goals of low-carbon economy should be considered. "The financial risk and economic downturns have triggered new thoughts and trends in China and they should be carefully evaluated," says Dudek. "But at the heart of them, is sustainable development." The country's massive investment plan will not come at the price of environment deterioration. Strict environmental evaluation of all the new projects is mandatory before construction starts, according to sources from the country's environmental watchdog. Wu Xiaoqing, vice-minister of environmental protection says recently that the ministry will place strict checks on energy-intensive, high-emissions, and heavy polluting projects in the national investment to boost economic development. The ministry has recently postponed approval for six chemical and thermal power projects with a total investment of 39.4 billion yuan. Wu says the Ministry of Environmental Protection (MEP) will continue to facilitate industrial structure adjustments and eliminate backward production facilities under the framework of the country's massive investment plan. The ministry will also speed up the approval process of environmental impact assessments of proposed economic boosting projects, according to Wu. "MEP will set up a 'green passage' for boosting domestic demand," says Wu. Since the unveiling of the country's 4-trillion-yuan investment package, MEP has strengthened its work on examining the environment assessment reports, according to Wu. On Nov 26 and 28, MEP approved environmental assessment reports for 93 projects, with a total investment surpassing 260 billion yuan, among which, 18 are about infrastructure construction, such as transportation and water conservation. MEP also worked closely with the Ministry of Railways on the assessment of railway constructions. Six rail lines with a total investment of 38.7 billion yuan have won approval recently. "The projects' impacts on the environment have to be examined before getting approval from the National Development and Reform Commission (NDRC)," a senior official from Ministry of Environmental Protection tells China Business Weekly, "this is written in the law." China's Environmental Impact Assessment (EIA) Law, effective since 2003, requires identifying and evaluating adverse effects to the environment and proposing measurements to mitigate them prior to project construction. As energy-intensive and high-emission projects have been ruled out in the massive fiscal stimulus plan, the investment package will not add too much of a burden to China's environment, said the official who declined to be named. A large portion of the investment has been directed to infrastructure, such as railway and road construction, expanding and building airports, according to the latest budgets publicized. The environmental risks of these infrastructure projects are lower than industrial projects, which tend to generate harmful emissions that contaminate water and air, according to an EIA expert. "Damages to the ecological environment are the major impacts of infrastructure construction, but with careful EIA works, the risks can be controlled," Liu Shu, a researcher at Research Institute of Highway affiliated with Ministry of Transport, who specializes in EIA on road constructions, tells China Business Weekly. Conservation of water and soil, stability of ecological system, biodiversity, and productivity of species are listed as the major concerns of and railway road construction. But EIA includes the treatments for these problems, Liu says. For instance, side-slope protection works along the railway can prevent the loss of water and soil. "Usually 3 to 5 percent of the total investment for a railway or road construction project is used to address environmental problems." Liu says, "With proper measurements, the ecological system along the rail lines and roads can be fully restored."